First accepted by Space Squid and published December 1, 2013. Published on The Glass Coin - April 8, 2013. Published by Danse Macabre (DM du Jour) March 6, 2013. Published by DreamScape Press (100 Worlds anthology) October 2013 - buy your copy of the anthology here! 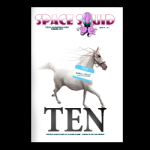 Published in print by Space Squid for their 10th anniversary edition (Issue 12) July 2015. Published on Mirror World Publishing's blog July 24, 2018. This is my shortest flash fiction (fantasy) story yet - only 149 words! Only 100 words in the anthology!